‘Tis the season for ghosts and goblins, and scary eats n’ treats. 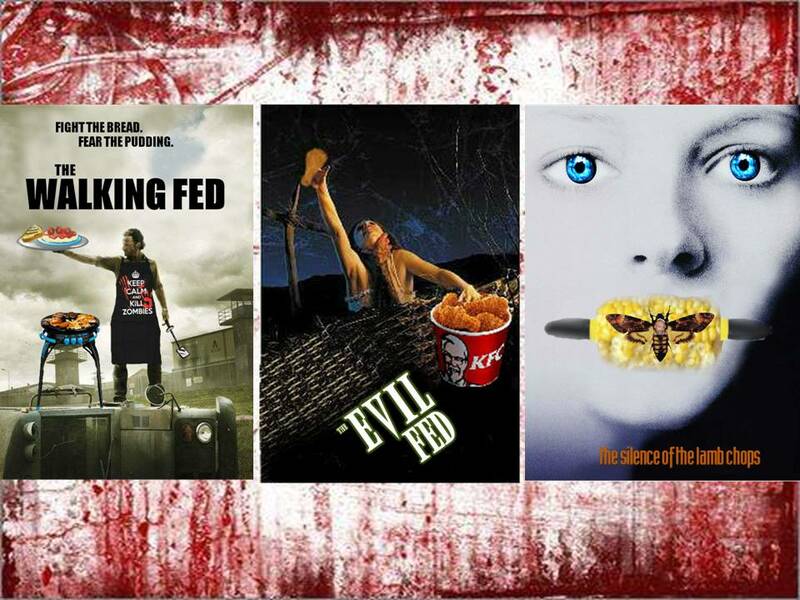 Whether you are headed to a Halloween Party at school, work, or the neighbors house, I wanted to provide you with some SINspiration that is sure to please both the young and the young at heart. 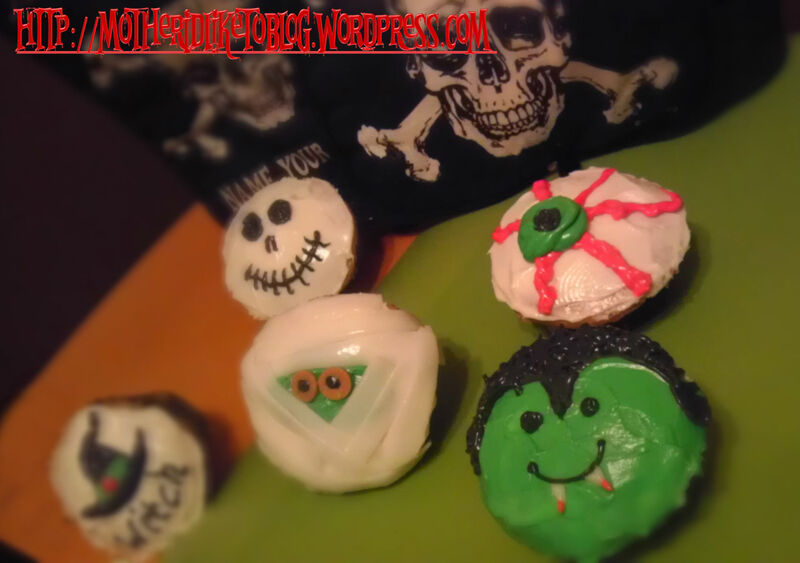 Best part about these goodies is that they are frightfully easy to create. I’ve included a few time saving tips so you can focus on the important stuff, like making sure the family is all spooked out and ready. 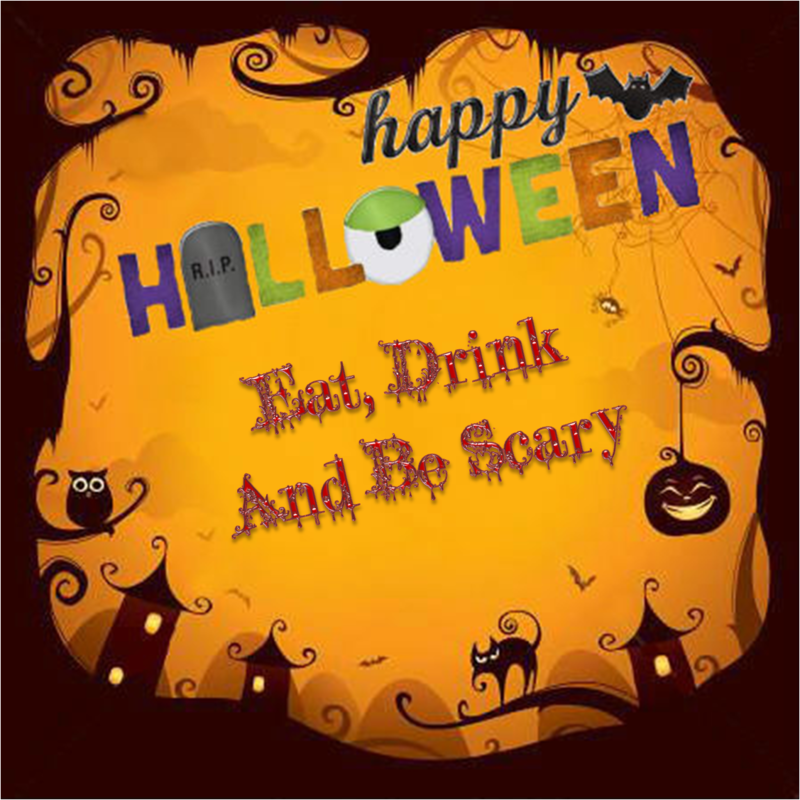 Happy Halloween and have a FANGtastic evening! This is a regular old sheet cake dressed up with ready-made candy including gummy skeletons and worms, and Scooby Snacks (graham cracker bones). The “dirt” was made by crumbling Oreo’s (without the filling) and graham crackers, and the tombstones are graham crackers with lettering written in chocolate. This cake requires a bit more skill. I could have purchased an actual skull cake pan, but I didn’t/haven’t. 🙂 I made one large round cake, allowed it to cool, then cut the skull out of it. 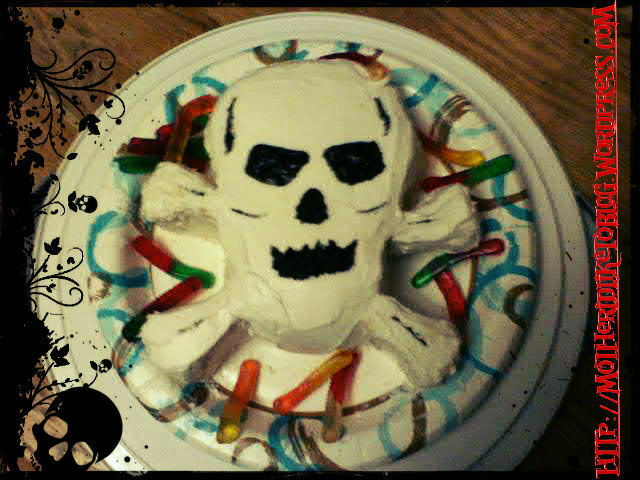 I used black icing for the eye sockets, nose, mouth, and detail. I chose to surround it with gummy worms for presentation. The wolves were made with chocolate frosting. Put a large dollop of frosting on each cupcake, then spread with a fork to make it look like wispy fur. The eyes and noses are M&M’s, and the teeth are Tic Tacs. The tongues were made using cherry Airheads. The googly eyed cupcakes are even easier. I mixed a small amount of chocolate frosting with white frosting to create a light brown color. 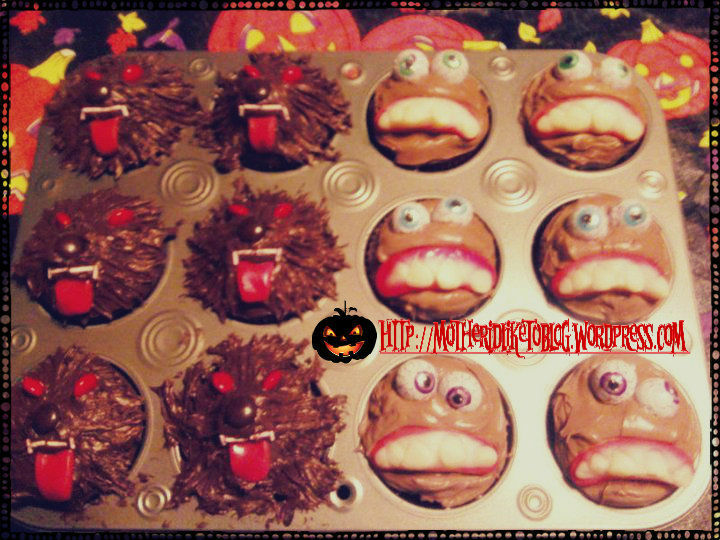 The crazy mouths and the eyes are ready made candy. These cupcakes are to DIE for! 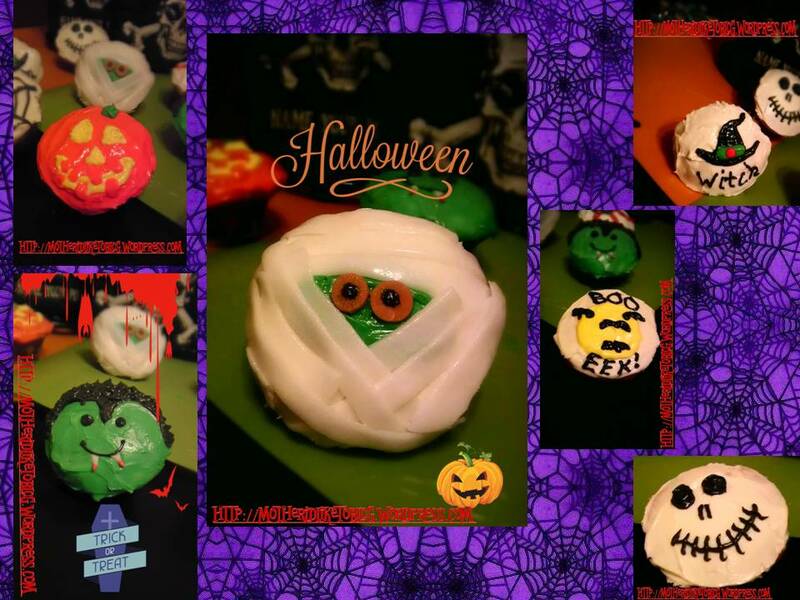 Most of these were decorated using colored butter cream icing. The mummy has green icing for the face, white mystery Airheads cut into strips make up the wraps, and the eyeballs are upside down peanut butter chips with a dot of black icing in the center. I also used the white mystery Airheads to create Dracula’s fangs. 1. Don’t bake! Purchase ready made sheet cakes and cupcakes from your local bakery/grocery store. 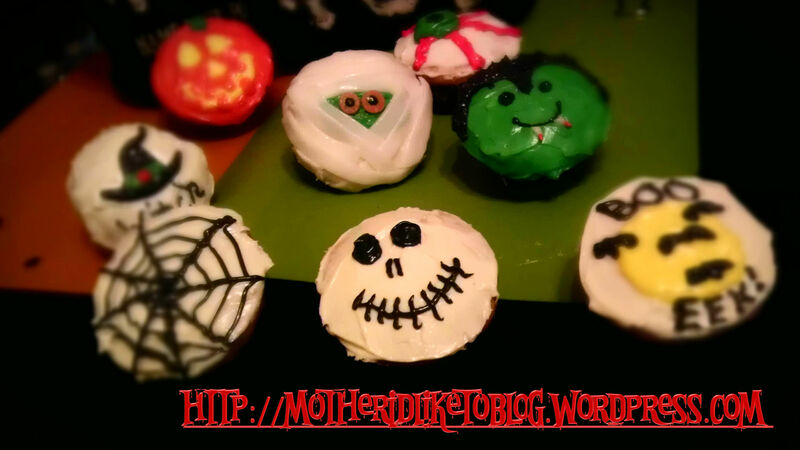 You can also use packaged muffins/cupcakes (like Little Debbie, Hostess, etc.) to decorate. 2. If you baked a treat but had to cut it into shapes, make sure you have enough icing to do a crumb layer. Don’t know how to do a crumb layer? Simple: After the cake has been baked and cut, put it in the freezer for at least 30 minutes. Remove it and while it is still cold slap on a layer of frosting. Return it to the freezer for another 15-20 minutes, take it out and frost/design as desired. 3. Buy a lot of white icing and food coloring and make your own colored icing. Pipe it on using a plastic baggie with a small corner snipped off. 4. Visit your local bulk candy store to purchase individual Airheads and other candy if you only need a few. It’s cheaper than buying bags and bags of them so that you have enough of the color you need. 5 more days ’til Halloween, Halloween, Halloween! 5 more days ’til Halloween! One, two Freddy’s coming for you! Three, four, better lock your door! Five, six grab your crucifix! Seven, eight gonna stay up late! I know technically Halloween isn’t a holiday, at least not a holiday where the free world shuts down anyway. However, Halloween has always been and probably always will be my favorite day of the year. What’s not to love? It’s a day you can put a mask on and forget how dull your life is the other 364 days of the year, party and eat candy. There is no pressure, unless you’re talking about the uncomfortable bloat you get about 9pm after two hours of “testing the kid’s candy just to make sure it is safe for them to eat”. Another bonus is that it occurs in Fall, my favorite season. Gentle days give way to windy nights and the only warmth comes from the colors of the leaves littering the yard and streets. A creepy feeling blows through the neighborhood and, wait! Did you just hear that? I could have sworn I heard a scream followed by a wolf’s howl. Never mind, it’s probably just a screech owl looking for dinner. At least that’s what we tell ourselves before we begin praying for daylight to deliver us from the evil cover of darkness. Anything is possible this time of year. You never know if the lady coming out of the grocery store really just sparkled in the sunlight because she was working on some crafts or if it’s just her nature. You may start to examine eye color to see if the stranger in front of you has blood red or a friendlier amber color. You might just find yourself squinting into the distance to see if you can decipher why that guy is stumbling along so strangely towards you with his arms outstretched, and is that blood running down his chin? Enjoy this time of year. Spend it with your favorite ghosts and goblins, and if you hear something go bump in the night, smile and be happy that the dead still find time to dance in the moonlight. 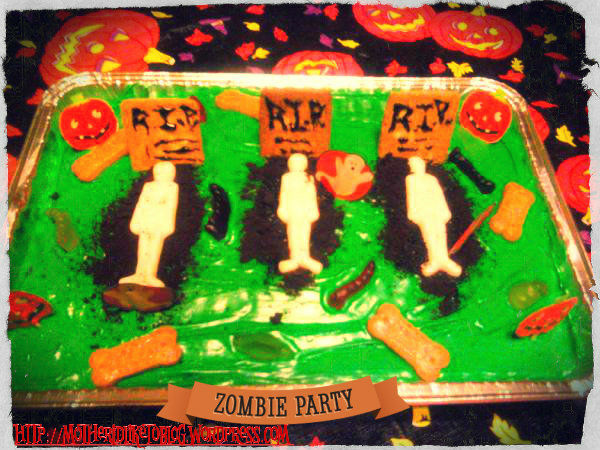 Great ideas…I especially love the skull cake! Thanks! It was a big hit with the classmates and teachers at my son’s school Halloween party. 🙂 I just love all the creativity that occurs between now and the end of the year. The sky is the limit! If you know you saw it on MILB, but can’t seem to find it now, try looking here. Enter your email address to follow this blog, or if you wish to know all the secrets of the universe. Just got the Suave Family VoxBox from @influenster and #suavebeauty. Can't wait to try the products!